Okwamanje is a self-catering thatched lodge which is situated in Marloth Park, between Lionspruit and the Crocodile River which separates this paradise from The Kruger National Park. Lionspruit is a game reserve open to residents and guests of Marloth Park, which hosts four of the Big 5, excluding elephants. The house offers two en-suite bedrooms, an open-plan kitchen, a dining room and a lounge area. Accommodating four guests comfortably, this promises to be an unforgettable experience with wildlife roaming freely in their natural environment. The living area is air-conditioned and has a TV with DStv but your own decoder is required. There is 24-hour security response and you will feel spoilt in this remote retreat. Laze in the splash pool during the hot summer days watching the wild animals such as giraffe, zebra, kudu, warthog, impala, bush buck and baboons. 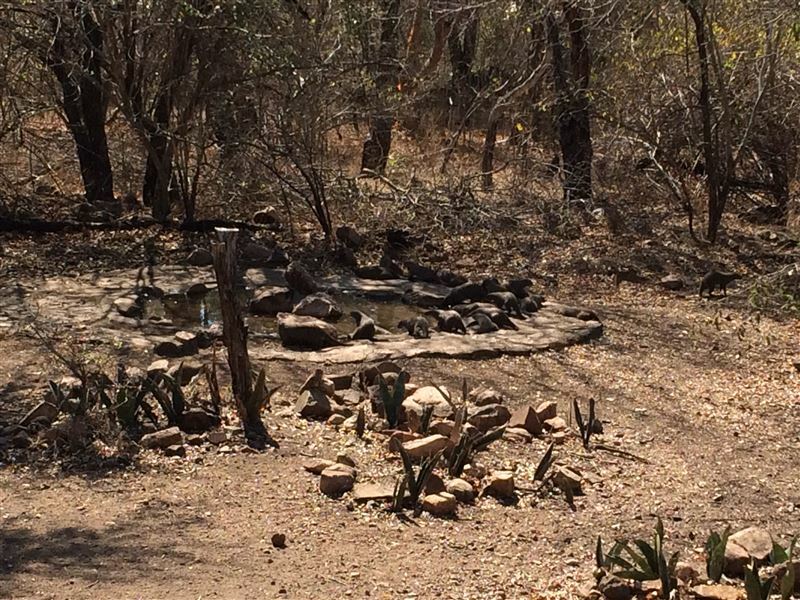 More than 100 bird species drink at the waterhole which is located just 10 m from the house. Listen to the sounds of laughing hyenas and roaring lions at night around the fire and be sure to put out some bananas for the residing bush babies as they awake just before sunset. Lovely, clean and well situated. We had a great time, and will definitely return. We enjoyed our time at Okwamanje thank you very much, the only thing that we did not have was the mosquito nets over our beds, especially for the little child, but on the whole it was a lovely stay, thank you - we will keep this web page for future.